As a member of the Anthropology of Smartphones and Smart Ageing research project, I am doing fieldwork among migrants working in Santiago de Chile. Among the many diverse migrants who live in this city, I chose to work with Peruvian migrants. Peruvians are the largest immigrant group in Chile: they represent 25.2% of the migrant population, according to the 2017 census. Many of them have been living in this country for over fifteen or more years, and most of them live in Santiago (65.2% of migrants live in the Metropolitan Region). During the first weeks of my fieldwork, I asked a Peruvian colleague –who was also living far away from his country– on advice about meeting his countrymen here in Chile. He advised me to approach Christian confraternities. Confraternities –in this case Peruvian– are groups of people who honor their local Catholic devotions. I started then to frequent a catholic church in the center of the city, which is famous for being welcoming and supportive of migrants. There I met Peruvians belonging to several different confraternities. Some of these confraternities honor Peruvian Marian devotions, such as the Virgin of Chapi, from the southern city of Arequipa, or the Virgin of La Puerta, from the northern city of Otuzco. Others honor Peruvian saints such as San Martin de Porres or Santa Rosa de Lima. All of them were as proud of their devotions as welcoming to my ethnography. Among all of the confraternities, I decided to join the most diverse in terms of regional origin, including even non-Peruvians: the Hermandad del Señor de los Milagros (Confraternity of the Bearers of The Lord of Miracles). This devotion originates in Lima in the seventeenth century and, although the largest confraternity can be found in the capital city of Peru, there are local confraternities –such as the one I joined in Santiago– all over the world, from São Paulo to New York (even in Hamamatsu, Japan). “Wherever there is a Peruvian there is the Lord of Miracles”, so I’ve heard them quote of Monseñor Hidalgo, the spiritual guide of the main confraternity at the Nazarenas church in Lima. The brothers and sisters have been very kind to me and have allowed me to join them in several activities along the year, such as regular meetings, spiritual retreats and ‘polladas’ (traditional funding events where chicken dishes are sold). 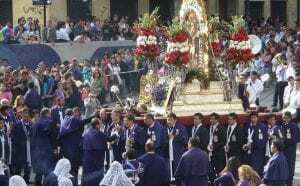 The biggest event of the year is the Lord of Miracle’s procession at the end of October, called the purple month, due to the typical color that identifies this devotion as seen at a number of activities (shorter processions, masses, retreats, etc). The main procession, lasting eight hours, takes place on the last Sunday of October. 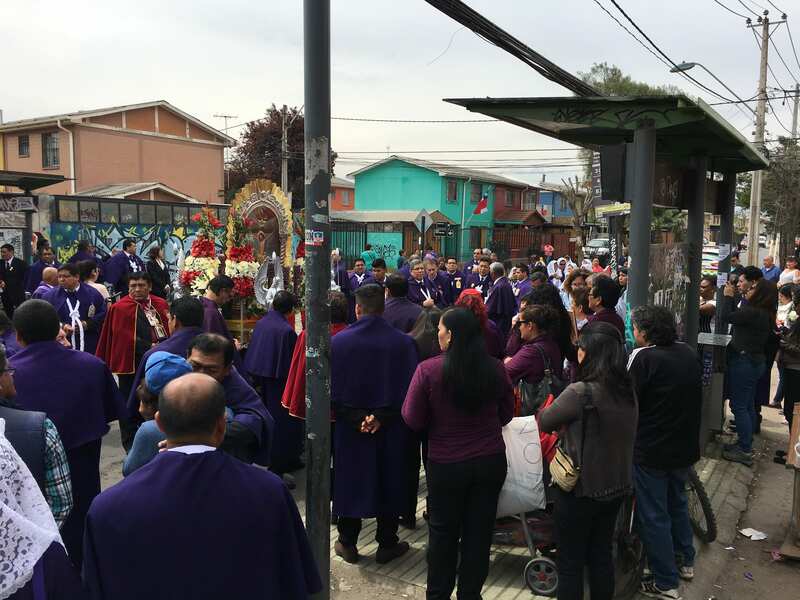 As a sign of the place of Peruvians in Chile, the procession goes from the Cathedral of Santiago to the migrants’ church, gathering thousands of devotees. I was invited to join one of the groups of thirty people carrying the 1.5 tons image. ‘Carrying’ is not only a body technique one needs to master (the hands at a certain position, the steps following the music) but also an honor. Besides, ‘carrying’ is a complex concept whose meaning linked to faith and community I am just starting to grasp. Most of the miracles I have been told about are in fact related to health: a surgery that went well, a disease that was beaten against all odds, a tumor that turned out to be benign. As far as I can understand, prayers and processions do not substitute medical procedures. I see in the chains of prayers, the dedication of a procession stages, and the participation in funding activities a sense of community, a display of collective care. What is interesting for our study in the ASSA project, is that this particular devotion is not only an expression of belonging, of tradition continued abroad, but it also opens the door to the study of the relation between faith and health. Institituo Nacional de Estadísticas Chile. 2018. Síntesis resultados Censo 2017. Santiago: Instituto Nacional de Estadísticas Junio / 2018.